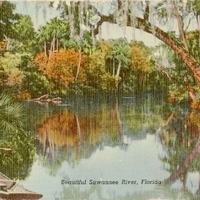 A postcard depicting a view down the Suwannee River, a federally designated "wild river." The Suwannee is almost 266 miles long, running from the Okefenokee Swamp in southern Georgia to the Gulf of Mexico in Florida, making it the only unspoiled waterway in the Southeast. "Suwannee River." Exploring Florida. http://fcit.usf.edu/florida/lessons/suwannee/suwannee.htm. “Beautiful Suwannee River Postcard.” RICHES of Central Florida accessed April 21, 2019, https://richesmi.cah.ucf.edu/omeka/items/show/6782.